A dim light flickers atop Independence Monument at the heart of Phnom Penh. Facing that monument — built to memorialize the nation’s independence from the French in 1953 — Prime Minister Hun Sen’s home looms tall, guards present day and night. I walk there from my home and sit, eating street food and looking at that light, wondering if it will ever burn out. A ten-minute walk away is the White Building, my home, and, behind that, the remains of the Grey Building. These two buildings were constructed a little after Independence Monument, as Prince Norodom Sihanouk sought to rapidly modernize the city into a regional and international hub. He sought a better Cambodia, for all Cambodians, and these affordable communal housing projects, for locals and for international visiting guests, were symbols of that mission. Together these structures have come to stand in my mind for the complex aspirations and struggles of modern Cambodian history. The food stalls are cheap and packed with city kids; teenagers riding expensive motorcycles are on dates, while homeless families beg for scraps from table to table. I finish my noodles and walk home. Like that wavering light, the White Building, is once again facing the likelihood of demolition, or “development” as it’s called here. Evictions feel imminent. The Grey Building just behind is now almost entirely built over, an ugly facade covers the famous work of Cambodia’s only starchitect, Vann Molyvann. The one section still remaining stands visibly vacant. The White Building is imposing. The exterior undulating surface of concrete cubes isn’t brutalist, but it has a modernist severity that is complicated by the addition of new walls, food stands, laundry, and so many people. Trees and moss grow out of poorly tended sections, rotting from the rainy seasons. When I come home for lunch every day, I am pleasantly greeted by my neighbors. “Where are you coming from?” They ask in Khmer. “Where is your fiancée?” “Have you eaten yet?” Any prolonged period of absence of just a few days prompts even more questions. You can buy fresh mangos and sandwiches in this building, you can go to school, get a haircut, and more. Entering the road at night, as I make my way back from Independence Monument, I’m welcomed by a line of prostitutes, their faces painted white. Their pimps eye potential customers as they text. It took a while, but now they seem to know I’m not a foreigner, coming for their wares, but a disinterested resident. The inside corridors are dark, and so the residents congregate in open stairwells for light and breeze. They play cards or idly lay in hammocks, gossiping. Children play a game with their flip-flops and run down the halls shouting. Sometimes they play ding-dong-ditch at night. Many apartments leave their doors open to catch a crosswind and to welcome guests, so walking down the hallways offers short glimpses of their lives. Most houses are full of people and laughter. Some are hollow. Some have seedy guests, in and out at every hour, playing cards or worse. I had been told that the Grey Building was entirely gone, and believed it until I got on the roof of the White Building. Looking down, I saw that parts of the southern wing still remained. One afternoon, I snuck through the underground parking lot of the soup restaurant that seems to own the property, and into the building. Like the White Building, the lower level had an open area designed as an open communal space to socialize in the shade. This public area had long-since filled up in the White Building with new apartments and shops. Here, it was filling up with newer, less-grand structures; tents, hammocks, and shanties haphazardly scattered the space, which itself had piles of construction material littered about. There was a small food stand and two people were eating lunch. The people there are staff of the soup restaurant, and were given permission by the owner to stay in the once iconic Grey Building. I asked if it was okay to walk around. I asked if I could take photos. They said sure. On the first floor up there seemed to be a few occupants, bricking themselves new walls, and I steered clear out of respect. The other floors were completely abandoned. On the top floor I wiggled my way up a branch-turned-ladder and onto the roof. In front of me was my new home, the White Building, the length of an entire city block. 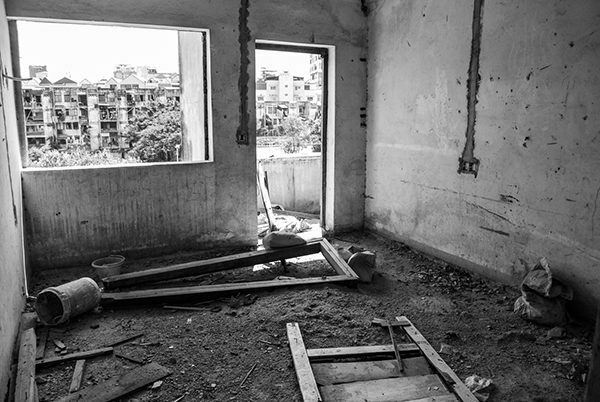 Separating the two buildings lays the Dey Krahorm land, violently evicted in 2009 for development, which to this day remains unused. All behind me are new skyscrapers rising up, wrapped in green safety construction fabric and Chinese characters. You can feel the luxury real estate from Koh Pich — Diamond Island — moving inland. Both the White and the Grey Buildings were built in a modernist ideal that feels so distant now. A belief that the spaces we occupied could transform the people within them, the society around them. Their architects, Vann Molyvann (Grey Building) and Lu Ban Hap (White Building), transformed Phnom Penh; building hundreds of parks, buildings, and monuments under the tutelage of Sihanouk from the 50’s and throughout the 60’s. Back then, the city was transforming into a cultural and regional hub, known for new and distinct architecture, movies, and music. Traditional wooden houses were being quickly replaced, not with colonial architecture, but with New Khmer Architecture, as it is now known. I imagine that at times, in that flurry of development in the wake of the colonialist rule, they felt they were building a new nation. While this period of Sihanouk’s rule, the Sangkum Reastr Niyum, or People’s Socialist Community, is remembered very fondly by much of Cambodia, it had a very dark side. As journalist Michelle Vachon recently wrote, like the current regime under Hun Sen, Sihanouk’s rule was mired by corruption, censorship, and politically motivated arrests, beatings, and even assassination. This legacy is nearly forgotten from histories of the White and Grey Buildings, which are remembered as social housing for a greater good, even though their very construction was preceded by forced evictions. Buildings are merely vessels for those that inhabit them. Like everyday people, buildings become the subjects of those in power, not real actors. True, buildings have subtle affordances, they can change the shape of our lives, but the real forces at play in the hearts of humans and in the bottom lines of cities, of nations, remain beyond their purview. 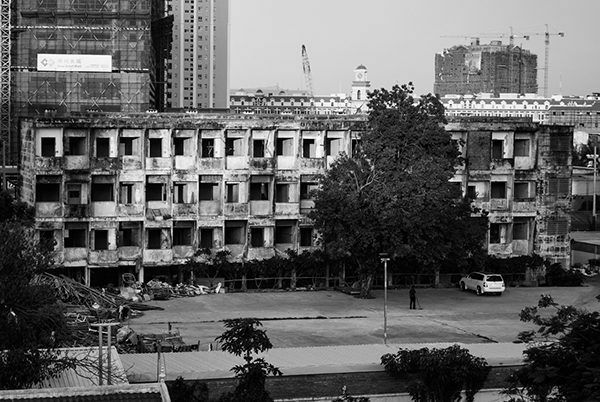 Maybe the White and Grey Buildings’ current state, like the state of Phnom Penh, serves as an ugly reminder of their true history. 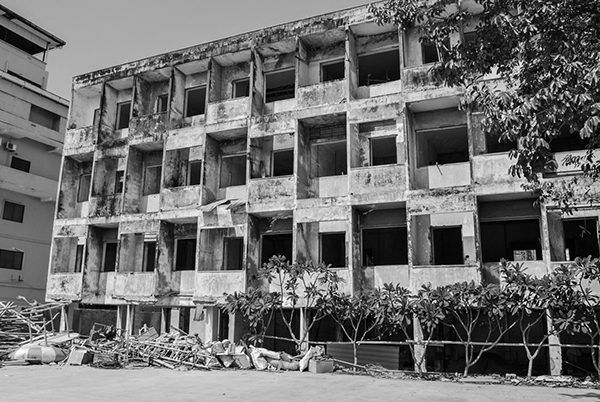 Whether realized or not, the idealism behind White and Grey Buildings were forgotten after Lon Nol’s coup in 1970, as the country was falling into a civil war. 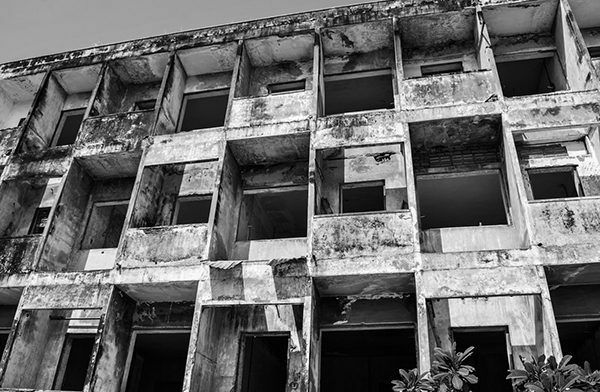 Then, abruptly, they were vacated entirely by the Khmer Rouge regime in 1975, and left to rot for over three years, empty. What chance did these buildings have in the face of the destruction of the nation’s human and economic resources, and in the aftermath of those brutal years of civil war? The Khmer Rouge regime left roughly a quarter of the population dead from starvation and murder, and the rest of it either traumatized and compromised, sometimes both, with so much to rebuild. The creativity and ingenuity that characterized the 50’s and 60’s was largely absent from that process, and still is. Like Sihanouk, Hun Sen’s Cambodia is marked by corruption, cronyism, and single party-control. Close ties to other countries have left the majority of Cambodians poor and underserved. Even as skyscrapers spring up around Phnom Penh, a small political elite, and foreign owners and businesses, are the true benefactors. While I’m only passing through; a lover of history and art, the idea of living in the White Building was too romantic to pass up, but not a necessity. This is not the case for the other residents, my neighbors. Now, as plans crystallize for their eviction, designs are revealed for the tallest tower in Southeast Asia. 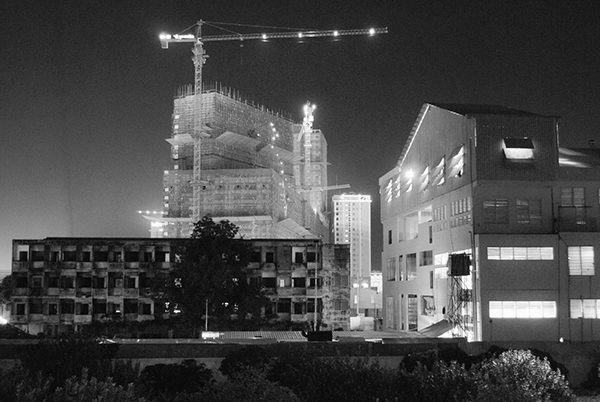 The 500-meter-high building will cast a shadow over the White and Grey Buildings. Whether or not they are still even there at the time of completion looks increasingly unlikely as redevelopment projects take form. As the tallest building in Southeast Asia rises, the ideal, that dream for low-income, quality housing that supported lower income families, that nourished a city as it rose into an international sphere, is buried every deeper. This causes my stomach to churn, though not as much as my neighbors, many lifelong residents. As for the long-term residents here, who will likely be thrown to the streets and poorly compensated, if at all — where is their new home? What new structures are growing in Phnom Penh for them? While perhaps the White and Grey Building’s were more symbolic than functional in their idealism, the fact that they existed, that the government – despite it’s many faults – were investing in them, was significant. Their presence signaled that there was a place for everyday Cambodians to live and participate in the capital. That, alas, no longer rings true.